It is the consensus statement — the statement resulting from the consensus questions — that becomes a position. The League can then take firm action or advocate for a particular issue addressed by the position. Without a position, action/advocacy cannot be taken. Local studies provide an opportunity to research a local issue, and perhaps will lead to a new position. Past studies that lead to positions are summarized with the LWV-Needham positions. A study of the approaches to improving communication between Needham residents and Town Meeting Members was approved at the May 2018 Annual Meeting. A committee and subcommittee are researching the topic and will report progress at the 2019 Annual Meeting. In 2018, LWV-Needham completed its study on community use of town buildings. Support maximizing the availability of town buildings for community use and ensuring that the town has a consistent, user-friendly process to obtain information, arrange for their use and provide support during their use. Given that making town buildings more accessible contributes to successful volunteer and nonprofit efforts throughout the town and improves civic engagement, the town should make the process of obtaining suitable space as streamlined and user-friendly as possible. While guidelines for who can use facilities should be as consistent as possible, it is most important that the policies for each space are clear and implemented according to the policy. Suitable spaces, including conference rooms should be made available for public use. Although the town might need to “bump” a public user of space, it generally should not be able to do so except when extreme needs arise. Information on spaces that the public may use should be readily available on town websites, including details on room capacities, costs, audio-visual equipment, and ease of filming for Needham cable, and information should be presented in a way that enables easy comparisons. While basic fees seem appropriate, the assessment of a percent of ticket sales in the Center at the Heights and in Powers Hall should be removed. The town should further support the users of town-owned space by sending confirmation of the reservation, providing a contact person in advance for room set-up, providing instructions on the room’s equipment on-site or in advance, providing information on who can provide support during the event, and providing a means for reporting on the experience with the space after the event. 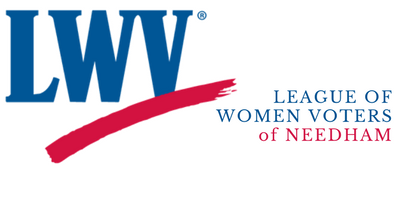 LWV-Needham is participating in the study of the Ballot Question Process in Massachusetts. The consensus meeting will be in January 2019. LWV-Needham participated in the study of Charter Schools in Massachusetts, completed with the passage of the new position on charter schools at the LWVMA Convention 2017. LWV-Needham has participated in recent national studies including Agriculture, Constitutional Amendments, and Money in Politics. There are currently no national studies.